The last few weeks I have been updating my house with little things to start to make it more homely. I love adding plants into every room, I love adding posters and framing them. I thought I would share with you a few ideas I have to update my work space to get motivated. If you are like me and need a clean, inspiring space to work in then read on. Clean: This may sound obvious but a clean space, house helps me to keep a clear mind. I love to keep on top of all the chores the best I can so that after a long day I can come home to a cosy space to relax. This also applies to my work space, I need a clean desk or room to be able to think. So a clean space is my number one advice when you need to stay motivated. Plants: The one thing I love about having my own house, space is to be able to buy little things to make it my own. I love adding in plants to my house, it makes it feel fresh and open. I think having some plants in your office will make a huge difference. Prints: I love a good quote to keep me motivated, I love to keep pushing myself to do better and stay strong. So a few reminders in the house in nice white frames would add a touch of inspiration. You can do this with a pin board too by adding pictures of your pets, family and things that inspire you. I need one of these when my office is complete, I have so many things to put onto it. 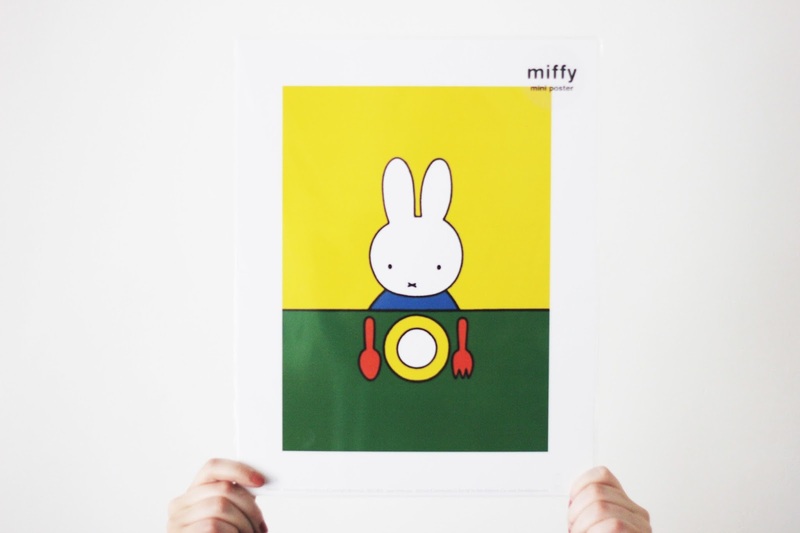 I am going to frame this Miffy print to pop it into my office, it is simple yet effective and reminds me of my childhood. When I have children I can see this being in the baby room. Stationary: Now this is a huge part of how I blog, make notes. I love to have a cute notepad at hand to write down any ideas I come up with for my blog. I keep some in my work space and I have one in my handbag for when I'm at work. This is a great excuse to buy cute stationary to keep you motivated. It works for me so that I can remember things and keep on top of ideas. update your work space with a few cute bits and you will be motivated to sit and do work/blog. Folder: One thing I have done from a very young age is keep a book or folder of inspiration. I cut out or tear out pages from magazines that I find helpful and stick them in my folder in clear sleeves. It helps to come up with ideas and I find it relaxing, I love creating things so this is fun for me. If you try this let me know how you get on? Storage: This is something I find exciting, finding new bits for my office/ house. I must admit I find most of my things from Ikea because my whole house is white. I love all the storage options you can get from Ikea. label each draw so you know whats in them to keep you organised. Being a beauty blogger, I need storage to keep all my beauty bits safe. I also have a draw of things that I have not yet reviewed. You can make your own prints for your wall out of magazine cut outs and framing them. This is something that is on my mind to do very soon, reusing all my old magazines and keeping some for reference all neat on a book shelf. i love updating my work space and I hope this post helps you. Let me know how you update your blog space. YES new stationery is a must, and I have fallen for so many cute prints lately!